Ms. Fujiko Nakaya, second daughter of Dr. Ukichiro Nakaya, visited ARC-HU yesterday on August 27. Dr. Yoshinori Furukawa, Professor Emeritus of Hokkaido University (former Director of Institute of Low Temperature Science) was accompanied by, too. She has been presented the foggy art in all parts of the world since she was known as “a foggy artist” and wrapped a pavilion in artificial fog with Osaka World Exposition Pepsi building in 1970. She is a director of Nakaya Ukichiro Foundation which is started Ukichiro Nakaya archive now. 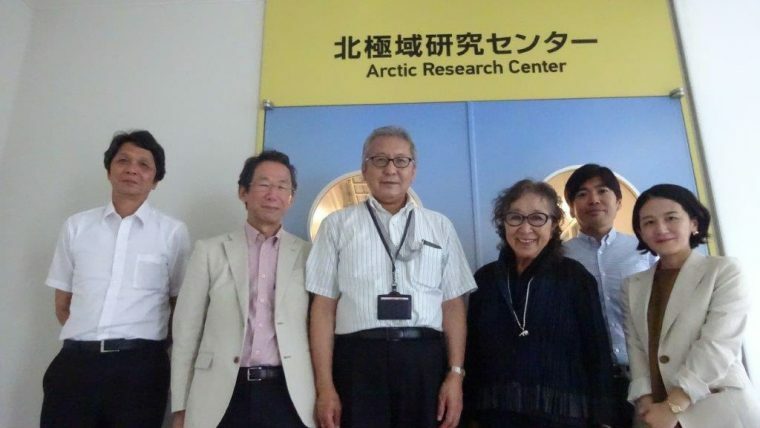 Our center would like to cooperate with an archive as an organization inheriting Arctic Research Spirit of Prof. Nakaya who visited the Arctic in 1957 at first and began immersing himself in his research there toward the end of his life.